At the Bakers Arms, we never underestimate the importance of pudding. Whether you class yourself as a pudding person or not, once you’ve enjoyed one of our tasty main courses, accompanied by a couple of glasses of wine to suit, a foray into our dessert menu is sure to deliver something to catch your eye and tantalise your tastebuds. The desserts on our pub menu are all homemade (of course) and we’ve come up with a range that features some all time classic favourites including a hearty Crumble and Custard, light and zingy Lemon Posset, boozy PImms Jelly and our luxurious and frankly rather beautiful White Chocolate & Raspberry tart. If you’re an ice-cream fiend, then worry not - we always have an array of interesting ice cream flavours to choose from and you can opt for 1, 2 or three scoops, depending on how much space you’ve got left to squeeze it into. If sorbet is more your style - we’ve plenty of that to choose from too. One of the classic Bakers Arms Desserts which we’ve been delivering to delighted customers for some time now is our deliciously decadent Chocolate & Fudge Brownie with Butterscotch Ice Cream. Rich and luxurious, one of the great things about it (and we don’t tell everyone this) is that our Brownie is actually pretty easy to bake. Admittedly, The Bakers Arms team do know their sieves from their saucepans when it comes to cooking up a storm, but our Brownie Recipe is a dream to whip up, it smells delicious whilst it’s cooking and it’s thoroughly satisfying to serve and savour. The Bakers Arms Droxford’s Chocolate and Fudge Brownie Recipe. Preheat your oven to 180c and line a 15x25cm, 3cm deep (or more is fine) baking tray. Break up the chocolate and pop that, the butter and the sugar in a glass or metal bowl, over a pan of gently simmering water (don’t let the bottom of the bowl touch the water though). Whilst this is melting, whisk your eggs (at least 5 mins with an electric mixer if you have one, otherwise 10 mins by hand - very beneficial for the biceps) . Cut the fudge into half centimetre cubes (try not to eat too much of it). Once the chocolate mixture has melted (you can stir it gently to help it along), remove your bowl from the heat and then gently fold in the whipped egg, trying to keep as much air in the mixture as possible. Pour your chocolatey mix into the baking tray, smooth lightly with a palette knife or the back of a big spoon and stick it in the oven for about 15 mins. Then whip it out and using the tip of a knife, gently break the crust in places so you can tuck your pieces of fudge evenly across your brownie. Quickly pop the tray back in the oven for 5-10 minutes - until the fudge starts melding into the chocolate. Either serve straight from the tray (if you just can’t wait) or let it cool a little before cutting into pieces. We suggest serving your Brownies warm with ice cream (because that’s the way we do it) but any way they’ll still be scrumptious. If all this talk of sweet things is not making your taste-buds tingle then perhaps we should mention the cheese selection on offer in the pub. An excellent alternative (or follow up) to pudding, our cheese choice is entirely sourced from Hampshire and we serve it up the classic way - with biscuits and our homemade chutney. We currently have the tasty Tunworth (a close cousin of Camembert), Stoney Cross (firm with a creamy texture and earthy finish) and Rosethorn Blue cheese (lighter than your average blue vein but totally addictive) and we can suggest a suitable tipple to accompany this champion of cheeseboards too. 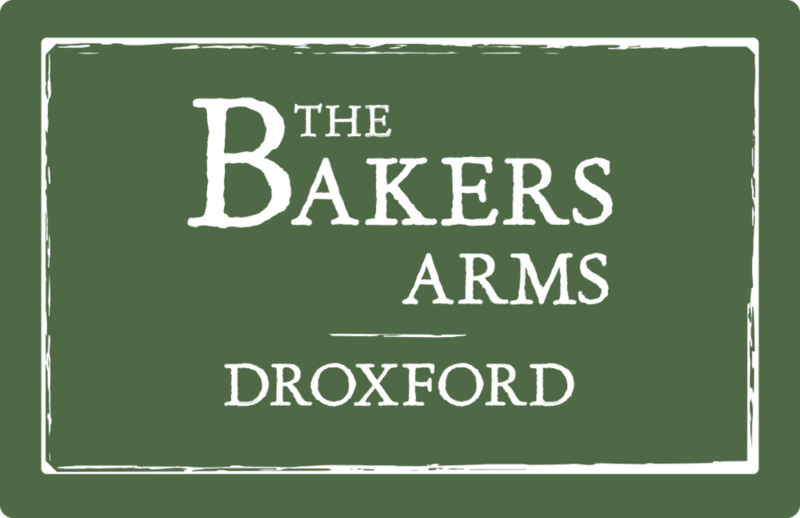 To book a table at the Bakers Arms, please give us a call or head over here. We look forward to serving you your just desserts sometime soon. A whistle stop tour around the Baker’s Arms NEW Menu.